Wind is a force to be reckoned with. It can stir up monsoons, carry dust thousands of miles, and sculpt rock into sinuous arches. 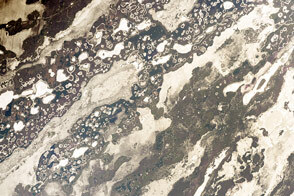 But sometimes, the effects of wind go unnoticed for years, like when it carves away slowly at the edges of a pond. A new study shows that winds are responsible for the widespread growth of ponds in three watersheds along the Mississippi River. The paper, published in April 2017 in Geophysical Research Letters , shows that wind-driven waves can erode pond banks, leading them to migrate in the direction of the wind. In effect, researchers have shown that wind-driven erosion, which nibbles away coastlines and the edges of larger bodies of water, can also happen inland on small scales. Ortiz and her co-authors found that ponds in the Mississippi Delta tended to expand in a southwesterly direction, which is the same direction as the prevailing winds (which blow out of the northeast). This was especially true in Terrebonne and Barataria basins, where 80 percent of the ponds are expanding. 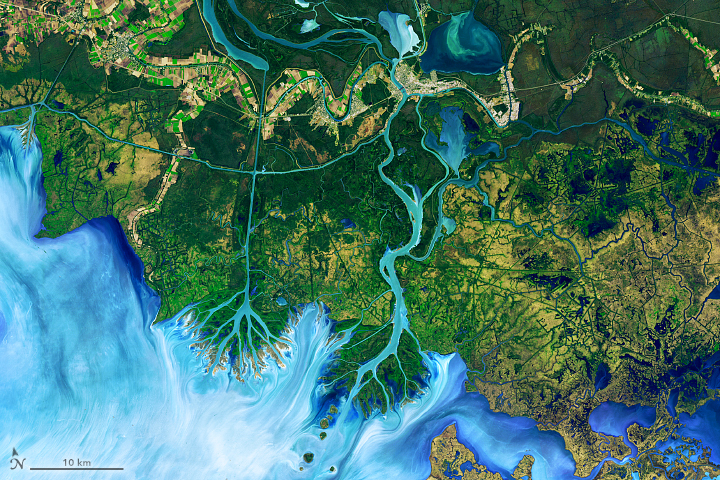 The other study basin, the Atchafalaya-Vermillion, was deemed stable, with nearly as many ponds contracting as expanding—roughly 30 percent. 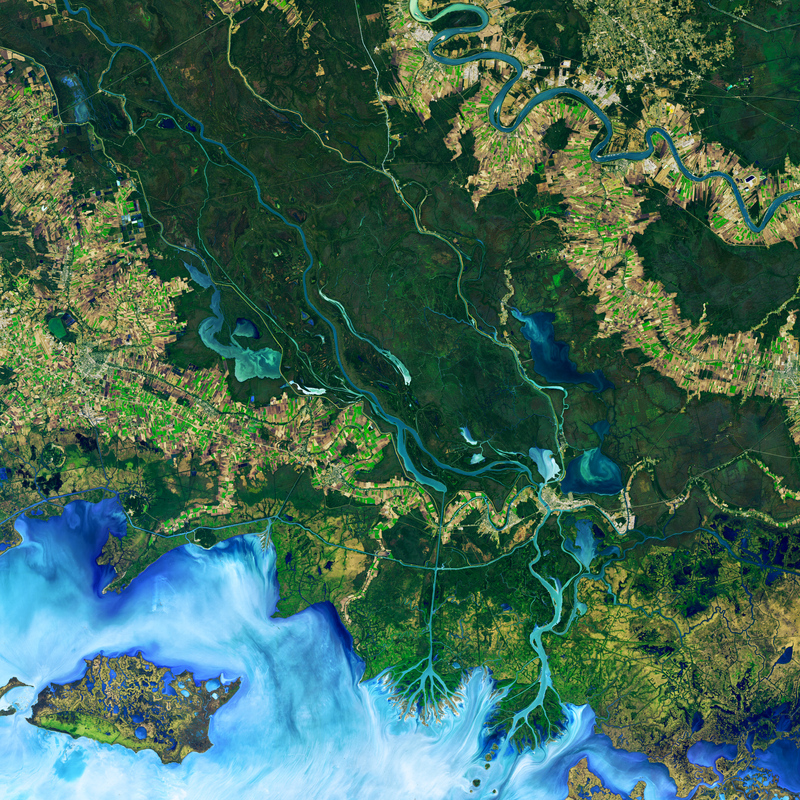 The false-color image above shows the area of study along the Atchafalaya Delta. 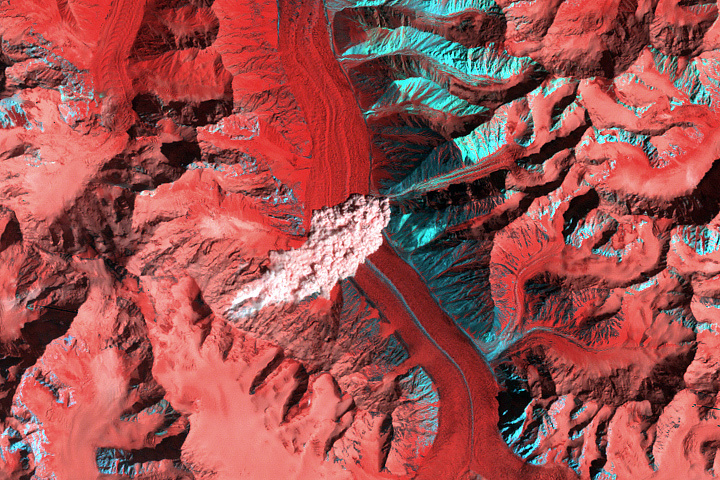 It was captured on December 1, 2016, by the Operational Land Imager (OLI) on Landsat 8. 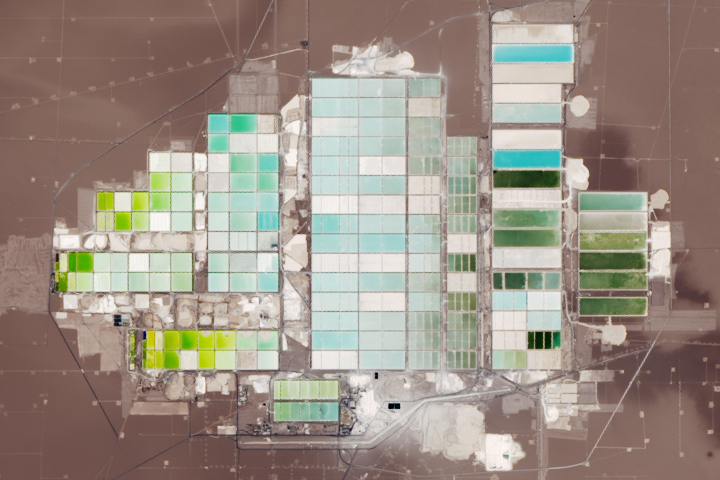 The colors emphasize the difference between land and water while allowing viewers to observe waterborne sediment, which is typically absent from false-color imagery. 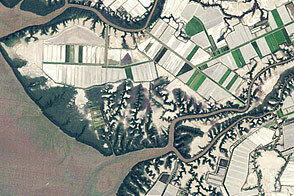 The images below illustrate ponds that have grown (blue) or receded (orange) near the delta. 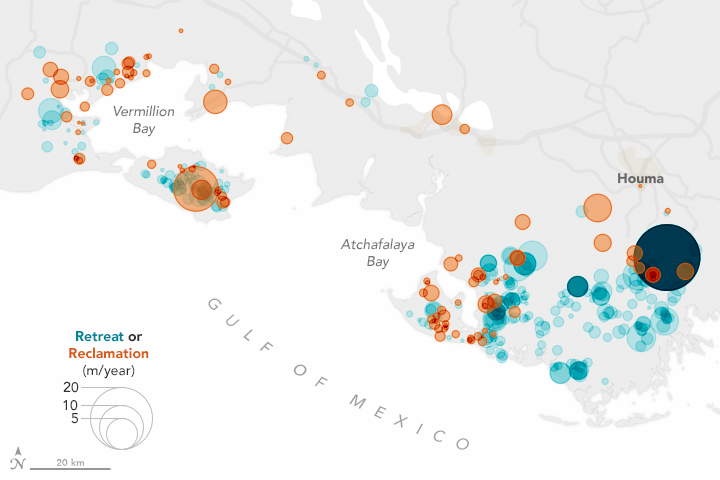 In areas like Houma, Louisiana, the size of ponds increased significantly. 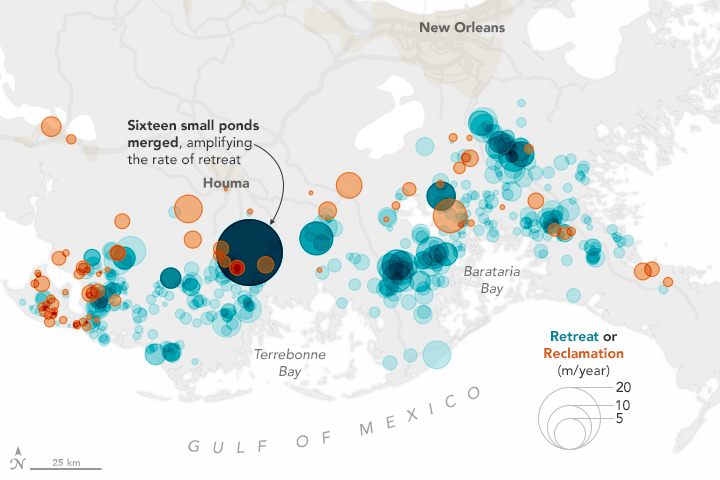 The Terrebone and Barataria basins have much higher pond density, making them more susceptible to pond merging—when two or more ponds migrate toward each other and produce one larger body of water. 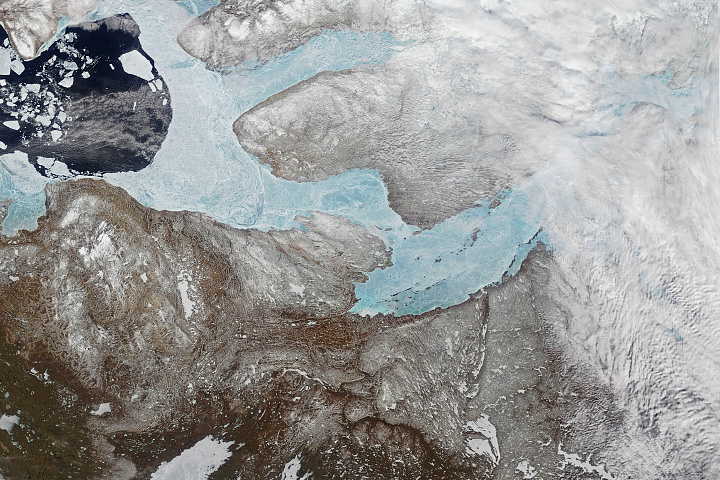 Some ponds were too small to generate waves strong enough to erode the shoreline. The researchers found that critical pond width was about 300 meters (nearly 1,000 feet). Ponds at least that wide offer enough open space—for wind to gather momentum, or “fetch” as sailors and meteorologists call it—to create waves big enough to nibble away the shore. Ortiz said the findings could affect the management of erosion-prone water bodies. For instance, managers could create physical barriers to prevent ponds from growing. “One possibility is thinking about putting in something that stops wave generation,” she said. 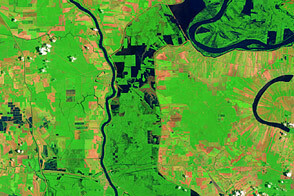 NASA Earth Observatory images by Joshua Stevens, using Landsat data from the U.S. Geological Survey and data from Ortiz, A. C., Roy, S., & Edmonds, D. A. (2017). Story by Pola Lem. A new study shows that winds are responsible for the widespread growth of ponds in three watersheds along the Mississippi River. Ortiz, A. et al. (2017) Land loss by pond expansion on the Mississippi River Delta Plain. Geophysical Research Letters 44 (8), 3635–3642. Coastal Wetlands Planning, Protection, and Restoration Act (2017) The Terrebonne Basin. Accessed July 5, 2017.